THE MANDARIN-ORIENTAL BANGKOK (*****L): Since 1876, and despite the presence of the neighboring top-luxury -but far less glamorous- Lebua, Shangri La, Peninsula and Chatrium, "The Oriental" (as still called affectionately by its returning guests) remains the best established five-star lodging in Bangkok, and one of most famous palace hotels in the world. In the shadow of the modern, quite unsightly 1970s "Main Wing", stands the sublime "Authors' Wing": the original Dutch colonial pavilion, where the legend of "The Oriental" was born in 1876. More than 18 million dollars have been invested in 2016 to beautify what was originally a basic lodge, hastily built for the first adventurous travelers visiting Siam, after the Kingdom opened to foreign trade with the signing of the Bowring Treaty. Somerset Maugham, Tsar Nicholas II of Russia, and Graham Green inaugurated the crampy and mosquitoes infested wing. It now houses the roof-topped "Authors' Lounge": one of Thailand most photographed locations, it is world famous for its so unique, stylish, romantic -and pleasantly old-fashioned "High Tea". The dress code is as strict as in a London gentlemen's club. It brings The Oriental a few, yet bitter, claims in Tripadvisor: essentially written by tourists from outside the hotel, wearing short pants and sleeveless shirts, courteously but firmly stopped by the efficient security staff. This policy meets the permanent satisfaction of the graceful Bangkok society, gossiping in the white rattan armchairs, listening to live soft music. Our last visit, right after the renovation, was enchanting. As conservative as a guest of "The Oriental" should be, we loved the whiter shade of pale design so much, and feared some defacing; on the contrary, everything looks like more enchanting than before. Experienced eyes will notice a slight difference in the structure of the double stairs conducing to the newest, most sumptuous suites designed for "the 1%" (leading CEOs, statesmen, world famous artists, and wealthy honeymooners...) on a no-limit budget. 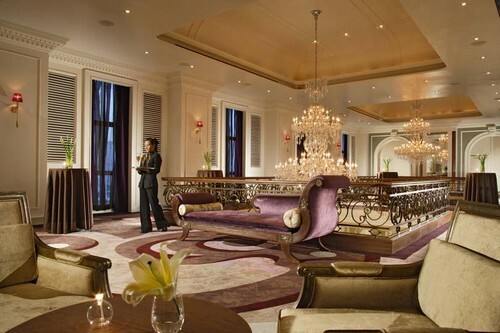 An authentic palace hotel, The Mandarin Oriental sells itself from the prestige suites first. We have inspected, and even stayed, in some of them (enjoying the noticeable "Captain Anderson" in the contemporaneous "Main Wing", for instance), and found them all different. Both in term of style and charm. But we mush aknowledge that those in the "Authors' Wing" left us voiceless. 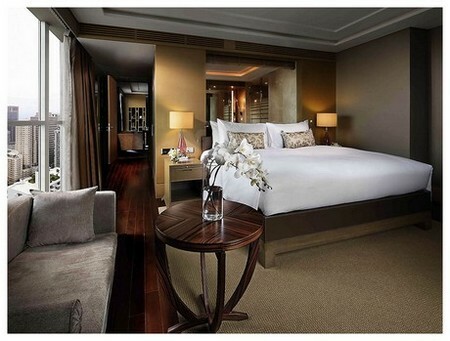 Totally privatized, the "Royal Suite" meets no competitor at all in Bangkok. This is simply the most impressive lodging in the Kingdom of Thailand. No picture and no words can describe the space, plush atmosphere, feeling of supreme power, and unmatched relaxation indulged during the exciting exploration of the 326 sq.m of luxury. It has only one king-size bed: which might seem odd due to the volume of the suite. But it connects directly with the 2-bedroom "Ambassador Suite", which is not less ritzy, plus another bedroom for security or maids. Decorated in the royal colors of yellow and purple, featuring original mouldings, silver leaf, and imposing crystal chandeliers, the "Royal Suite" comes with no bling but a spontaneous elegance. The living room, and the ceremonial dining room (sitting 12 guests), have been designed for dignitaries. There is a private gym and a SPA treatment room (but no sauna nor steambath). This is also the place for wedding parties and fashion photo shoot. The bathroom would please the most megalomaniac guest, indeed! Our December 2016 stay, gave us the opportunity to experience the same room like one year before. A "Premier Room", now rebranded into "Garden Room". Located in the "Garden Wing", the "boutique" section of the hotel, dating back from the 1950s, our totally refurbished room featured a split level layout. Covering "only" 35 sq.m, it really looked like a suite. Featuring a cozy bedroom and a lavish marble bathroom, with stylish silver taps, on the mezzanine floor; and a colonial-inspired, chic contemporary living-room on the ground floor. It looks like an artist loft, with its floor-to-ceiling windows overlooking the garden and river. The nook, once hosting the writing desk, has given place to a large bar filled with complimentary drinks from the best local and international brands, including beer, house wine... and a personal reserve of the yummy "Mandarin Oriental Bangkok" signature coconut ice-cream served with style at the swimming pool! Thumbs up for the initiative. Carefully displayed on the table of our living-room, we found a best-of all the bonuses expected by the experienced Oriental guest: wine, fresh snacks and tropical fruits, a welcome letter handwritten by the general manager, and an invitation to the fancy and exclusive "management cocktail party". Organized once a week, it allows the VIPs, suite and returning guests, to meet each other in the "Authors Wing", taste Thai snacks, wine and fine liquors, enjoy live Siamese music and dance, exchange their impressions and formulate any request to the management. There is only one hotel in the world organizing such a party, and we always calculated the day of our visit to make sure that we would not miss it. This is actually part of the folklore launched by Khun Kurt (Kurt Wachtveitl), "the man who did The Oriental". He retired in 2009, after more than 40 years devoted to "his" hotel (replaced by the dynamic Amanda Hyndman, who fell in love with the hotel when she was a young traveler). Khun Kurt remains the special adviser and ambassador of a soulful hotel, with a very low turnover among the staff... sometimes working here for decades, and actually knowing regular guests' -including the Royal Family- personal tastes and special requirements! The much devoted, anticipating service, always gave us the impression that we were staying in a royal palace. We have always been called by our name by the so friendly female head-concierge, and the discreet though efficient floor butlers (bringing us complimentary evening snacks, wine, and beautiful bouquets, or shining our shoes without any special request from our part!). We would like to understand how the lift-boy at the "Main Wing" (how many hotels still have a lift-boy nowadays?) can send the guests to their floor, faultless from the first until the last day of their stay? And also, why did the butler always emerged at the right moment to open our door? We had one secret revealed recently: there are motion detectors hidden in the rooms, to check whether it is occupied or not. The staff won't, therefore, never disturb the guests; rushing into the room as soon as they left to refresh it completely, everytime it looks necessary! The hotel is located in the last area in Bangkok where oxygen remains more or less generously available... Let's cross the river aboard the hotel private teak-wood shuttle boat (also deserving the nearby BTS Sky Train station), land on the right bank, and visit the “Sala Rim Naam”: where royal Thai cuisine can be enjoyed in a typical “Sala”, with live Siamese traditional music. Next door stands the most prestigious SPA in Bangkok: an Eden, made out of precious teak wood, devoted to relaxation, with a new Ayurvedic Penthouse where we had a well worth the trip 90 minutes massage and treatment, performed by selected Thai masseuses proficient in the Indian techniques of relaxation and soothing. Alternatively, the very complete and soothing 90 minutes Signature Massage is excellent (approximately USD 130, and worth it). This Thonburi bank is also housing the quiet Thai Cooking School, and the very high-tech and chic Fitness Club. Near to the school lives "Khun Tong Jah": a very talkative bird, who shall greet you with a phony "Sawatdee Khrap" ("-Hi! "), or "Khap Khun Krap" ("-Thank you")... if he likes your face and feels in a good mood. Traditionally overpriced, always full for dinner (but with a reasonable offer at lunch time), “Le Normandie”, remains one of the most awarded French restaurants in South East Asia. "The China House" serves in style a most authentic Cantonese cuisine. Refurbished from its original, warm and picturesque design into quite a conventional coffee-shop, “Lord Jim” is an excellent alternative for both affordable and palatable international food. We actually prefer “Ciao”, the open-air terrace restaurant (opened during the “dry season” only), its palatable antipasti, pasta, and seafood, with a breathtaking view of the river which must be experienced after dark. Note that this is, with the "Riverside Terrace" (serving splendid chargrilled BBQ lamb and blue river lobsters in the evening), the last place where you could freely enjoy a good cigar; a strict law now takes over the gourmet and “aficionados”' freedom to smoke in air-conditioned and "public areas" (which, in Thailand, means everywhere! ); even the now smokeless, freshly beautified Bamboo Bar, despite the entertaining live music, lovely jungle theme with deep leather sofas amongst palm fronds and authentic bamboo shades, lost part of its soul; with a clean air, the once so animated Oriental jazz-club looks like as aseptic as a Swiss clinic... Ironically the Habanos shop, with a selection of the best tobaccos from Cuba, stands next door! Needless to say, The Oriental is one of the Top 10 most expensive hotels in Thailand; nevertheless, it actually remain affordable to a large majority of travelers, so happy to spend only 50% of what they would pay in a Paris or London palace hotel, for more space and an unmatched level of service... Those visiting Bangkok only once in their life should stay nowhere but in The Oriental! This is the flagship of the Mandarin-Oriental hotels group. INTERCONTINENTAL BANGKOK (*****L): We didn't schedule it, but checked-out from the Intercontinental Paris Avenue Marceau, the smallest InterConti in the world, to check-in a couple of days later into one of the largest properties managed by this prestigious group. The contrast was such, that it accentuated the cyclopean aspect of one of the best located five star luxury hotels in Bangkok. Full house the day of our visit, during the much attended Bangkok Chinese New Year, this was a perfect schedule to check how the service would react with crowds of guests and clients for the bars and restaurants, pouring night and day into the palatial lobby. It was actually so-Thai and so-InterConti: which means smiling, cool, anticipating and definitely faultless. As smooth as silk! The 381 rooms and suites made us much of an impression. Our “Grand Deluxe”, equivalent of a standard room, oversized (45 sq.M), with a panoramic view, would have pleased the most spoiled traveller. Little bit jet-lagged, we could confirm one more time that InterContinental equips its rooms with the best Posturepedic Sealy mattresses, linen and pillow menus ever. We liked the ergonomic work space with lighting and stationary, and the ritzy bathrooms equipped with an Agraria toiletry kit. There is 46” Flat panel LED TV, DVD player and iPod docking station. Unless you are a privileged IHG Ambassador cardholder, or a suite/Club Room guest, you will be charged for using high-speed internet access / Wi-Fi. The 37th Club Lounge is remarkable, by the way: we have experienced lots of InterContinental Clubs around the world, and from our quite good memory this is -with InterContinental Paris Le Grand- the largest, most luxurious and best serviced on the planet: with high-end F&B, and a most dedicated staff. We would choose to stay at this hotel only for the ecstasy of relaxing in such a classy environment. 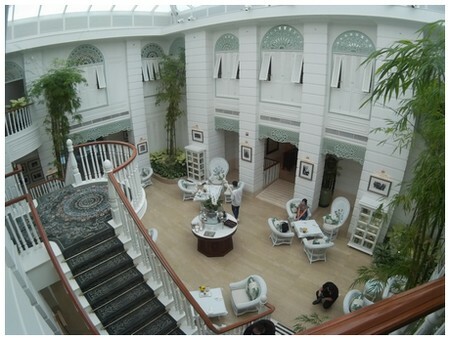 Last but not least, the panorama is inspiring, with a view over The Royal Bangkok Sport Club and the Erawan Shrine. We enjoyed refreshment bar, afternoon tea and evening cocktails and canapes at the Club Lounge; but preferred to have our buffet breakfast downstairs, at Espresso. 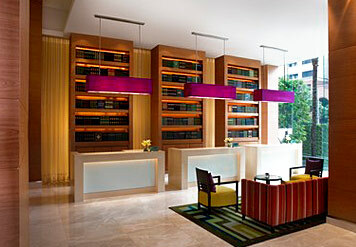 It beats, both in selection and quality, the abundant and top class Mandarin Oriental Bangkok. This is not the cheapest five star buffet (and Sunday Brunch) in the city; but it is worth each cent you would invest on it. The Japanese food-station is memorable, with ultra fresh sushi; the Chinese soups, rice noodles and Dim Sums is a Cornucopia of delicacies. We had a close look, but didn't taste, the lunch buffet: even more impressive than breakfast! We rather experienced the trendy Theo Mio: Italian kitchen by fashionable chef Theo Randall. Fine, and affordable despite on the hotel ++ on the bill: moreover if you order “piccolo” portions, which are sufficient if you also wish to order a yummy dessert, like the irresistible “Crostata di Limone” (Lemon Tart with Vanilla Cream). We promised ourselves that we would smoke a cigar at Balcony Lounge & Humidor Cigar Bar; but time flew, and we postponed it to our next visit: the Thai law is extravagantly repressive with tobacco, and the Land of Smiles looks like Hell to cigar aficionados. Fighting the prohibition in such a ritzy lounge, one glass of Ron Zacapa Centenario in hand, must feel like orgasmic. What else? More restaurants (good), ballrooms (huge), one terrace pool (small but pleasant), a concierge (efficent), and a five-star-plus SPA with lovely massage suites and inspiring masseuses, where we enjoyed a professional, courteous treatment in an authentic Siamese atmosphere. If all InterContinental hotels in the world would be that superlative, we would not drop our luggage anywhere else. CHAKRABONGSE VILLAS (*****L): Lodging in a royal palace and receiving a princely treatment is everyone’s dream. “Secret Retreats” anticipated our megalomania, guiding us to one of the most inspirational properties from their catalog of ambrosial hotels, villas, cruises and restaurants. Spoiled by our three-week stay in the best five-star hotels in Asia, surprising us was a challenge. Yet, we knew that our taxi was driving us to an excellent address: in the heart of the fascinating old Bangkok, near the fragrant and so beautiful flower market, Museum of Siam, Wat Pho, and the Royal Palace. Along the lively riverfront. Our driver almost missed the elegant entrance gate, with a discreet plate indicating “Chakrabongse House” (pronounce “Tcha-Ka-Bong”). No need to ring the bell: the efficient security officers already saw our car on the CCTV, letting it enter into a large courtyard used as a parking lot. A second gate opened to the Gardens of Heaven surrounding one of the most spectacular boutique hotel which we ever visited in our luxury travelers’ life. An authentic aristocratic mansion, the “Chakrabongse House” stands proudly opposite the small reception office. Built in 1908 by HRH Prince Chakrabongse, it was originally used by the prince and his relatives to attended royal ceremonies in the Grand Palace, and also for picnics and excursions on the river. Later, after the 1932 revolution, it became the residence of HRH Prince Chula Chakrabongse, writer and historian. An illustrious member of the family of the Chakri Dynasty of Thailand, Prince Chula was a grandson of King Chulalongkorn. The only child of Prince Chakrabongse Bhuvanath and his Ukrainian wife, Ekaterina (Catherine) Desnitskaya (later Mom Catherine Na Phitsanulok), whom love story sounds like a true reminiscence of the semi-fictional novel “Anna and The King”. We have been lucky enough to visit the Chakrabongse House. This was one of our privileges during a tailored made stay. Still a private property, it is closed to the public and owned by Princess Narisa (Prince Chula’s daughter). The living room, cabinets and offices, corridors and large dining rooms feature the travel and sports souvenirs of this jet-setter and renowned car racer. A resident of the UK, he was actively supervising his cousin Prince Birabongse Bhanudej (“B. Bira“) White Mouse Racing team. Pictures of his races aboard his ERA car, ancestor of the formula one, are exposed in the living room invaded by precious books. An author, he wrote a respected history of the Chakri Dynasty, and also “Blue and Yellow” (a biography about the race-car driver Richard Seaman), travel books (“First-Class Ticket”), his autobiography and some novels. This litterature is available from the “River Books” publishing house, operated next door by Princess Narisa. Opposite the Chakrabongse House, lovely Siamese villas have been built to welcome the guests of this mundane and hospitable family. Including celebrities like Aung San Suu Kyi. Since a few years, this secret address operates as a boutique hotel. Besides the exquisite Phraya Palazzo, this is from what we know the one and only old Siamese riverside residence offering premium accommodation to the handful of lucky travelers who booked much in advance in one of the four suite/villas, or in the three smaller, yet deliciously cozy rooms. We must have a good Karma: we could stay in the traditional teak “River View Suite”, with a huge terrace on the Menam Chao Phraya, and a romantic gazebo where our private breakfast was served at sunrise…when the opposite Wat Arun (The Temple of Dawn) and the Old Palace woke up. Tropical wood, precious silk, and Thai antiques alternate with modern paintings and Knoll Barcelona leather seats. Decorated, like the rest of the villas, by the “maîtresse de maison”, it didn’t make us feel one single minute staying in a hotel. A private house, indeed, it features a large double bedroom, kitchenette, bathroom, study, sitting room and a veranda. It has a direct access to the pier, where a chartered boat tour the hosts from the river to Thonburi most secrete canals and floating markets. The Chakrabongse Villas owns a rare and splendid “Riva” from the 1960s. This is surely the unique hotel in the Kingdom having this magnificent “Rolls Royce of the Seas” at guest disposal. Each villa is equipped with an individual thermostatic controller for air-conditioning and humidity, TV/DVD with in-house movies, personal minibar, complimentary fax/printing on request, and complimentary Wi-Fi. We liked the wall of windows allowing a cinematographic panorama on the river from our bedroom and living room, and the intimate writing desk which would inspire a novelist. The place is ideal for artists, old-school travelers, and jet-setters, but also for honeymooners. The Chakrabongse Villas specializes in weddings, and the property is regularly hired for very exclusive parties. It is then totally privatized so that guests should not be bothered by the animation. Shouldn’t it be the episodic noise of the speedboats powerful motors, which didn’t disturb us though we stayed in the closest villa to the river, we spent four days in an oasis of silence and greenery. Which impressed us: so close to tourists’ haunts like the Grand Palace, and with popular markets opened day and night all around. The staff was nonobtrusive, though super-efficient. For instance, we sat each morning at the gazebo for our a-la-carte breakfast; five minutes later coffee, eggs, soups, and fruits were brought to our table by a ravishing feminine butler, who never forgot to drop a copy of the Bangkok Post on the table. Service in Thailand is good, everybody knows; but at the Chakrabongse Villas, it is definitely personalized. The lushly, well-kept gardens with centenary trees diffuse the essences of a large variety of tropical flowers. It is magic to enjoy them after dinner, illuminated by guirlands, and animated by the songs of the frogs playing over the fountains and along the large salted-water swimming pool. The kind of lodging which makes us like traveling, the Chakrabongse Villas is not more expensive compared with an international five-star hotel in Sukhumvit. Warmly recommended! 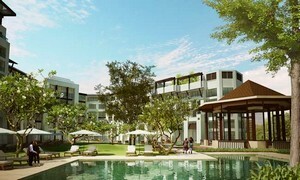 CHAKRABONGSE VILLAS: 396 Maharaj Road, Tatien, Bangkok 10200, Thailand. THE SUKHOTHAI (*****L): Distinguished, refined, princely serviced, this legendary hotel offers the best of what one could expect in term of old school Siamese hospitality. Close to the animated Sathorn / Silom roads, with its trendy pubs, malls and firms headquarters, but remote enough from the street to provide a quiet environment in a nicely designed compound, this is one of our crushes in Bangkok. Stepping into one of the most nicely designed lobbies downtown made us feel suddenly so Zen: feeling like in a temple of luxury. The design is awesome. The music piping from the bars and restaurants sounds hypnotic. And the staff… Omnipresent, the most beautiful hostesses have been hired to welcome the visitor. The guest relations and F&B officers addressed us by our name a couple of hours after we checked in, competing in professionalism and style with the superlative Mandarin Oriental. The Superior Rooms and Deluxe Studios ideally fit a short business trip; but like any authentic palace hotel, The Sukhothai illustrates itself by splendid and large suites. Famous artists and dignitaries book far in advance the 198 sq.m “Sukhothai Suite”, decorated with Jim Thompson silk, and featuring all luxuries… including a grand-piano. The “Beaufort Suite” and “Deluxe Residence Suite” are equally top-notch, though we would recommend the surprisingly good value for money “Executive Suite”. We had been booked in this 76 sq.m, exquisitely decadent, open-plan bedroom-living room accommodation. With wild orchids and succulent homemade chocolates awaiting us on the large waiting desk, we got our initial impression confirmed that we were staying in one of the best-managed palace-hotels in the Kingdom of Thailand. We liked the complimentary Wi-Fi, the large screen Samsung TV with Bose home theatre system, the sense of detail brought to each piece of furniture and item featured in the suite, and superlative glass walled bathroom: huge, with a distinctive parquet and a walk-in closet, we would rank it in our top 5 the best five star hotels in the city. Grand is the best adjective to describe this palace fitted for a king: with long corridors, refreshing open places filled with ponds and tropical flowers, and well-sized restaurants. F&B does count at The Sukhothai, attracting not only tourists but also many local patrons. If Celadon, where we enjoyed a toothsome dinner, initiates the gourmet traveler to the subtlety of the royal Thai cuisine, the rest of the restaurants and bars are leading venues for the local social elite and members of the diplomatic corps. The tastes of the world are provided at Colonnade, with a sushi making station, and a nice view of the ponds and gardens. This is also where the ambrosial breakfast is served. The Sunday Brunch at Colonnade is well known by all those happy few who circumvallated Southeast Asia. Same with La Scala: though we are more attracted by smaller, individually operated trattorias, all the comments received from some readers incite us to experience this premium Italian restaurant during our next stay in Bangkok. Salon is famous for its “Chocolate Buffet”, Thimian for its pastries and macaroons, and The Zuk Bar is the place for a chic aperitif or cocktail. The swimming pool is actually large (25-metre), with a relaxing Pool Terrace Café & Bar. The renowned Spa Botanica, and the modern and chic Fitness Centre (including a tennis court, squash court, Jacuzzi, sauna and steam rooms), complete one of our preferred hotels in Bangkok. CABOCHON HOTEL & RESIDENCE (*****L): A top 10 B&B Inns in Bangkok by Tripadvisor, and definitely one of the most exclusive hotels in Thaïland, this residence boasting only 4 Suites and 4 Studios is secretly located at the end of a cul-de-sac, in the fashionable Sukhumvit Road. Though all the banks, prestigious shopping malls, best restaurants, BTS station Phrom Phong, and tourist attractions are located not more than a five-minute walk, the atmosphere at Cabochon remains day and night incredibly quiet: reminiscent of a British colonial gentlemen’s club. Architect Eugene Yeh successfully recreated the Shanghai chic of the 1920s. Immaculate façade, ivory windows, rich columns and prosperous balconies might look little bit pompous; but once in the building, each single detail reflects imagination and good taste. We felt like stepping into an old-fashioned membership club: there is no lobby, but a Parisian concierge-lodge like reception. We were not feeling in a hotel at all; which was finally pleasant after a couple of weeks spent accommodated in five-star international brands. It would take the whole review describing the original small items and antique catching the attention of the guest. All of them are related to travel: books, maps, turtles and further exotic animals decorating the lounge and the lively corridors, up to the rooms. Trunks are omnipresent everywhere… even in the concept of the elevator, which gave the impression that we entered inside an old Vuitton trunk. We loved that! The designer is a genius. His skills extend to the studios and suites, decorated with classical murals and montages, vintage-style beds with precious Belgium linen bed sets, a super large working desk in the spacious 58sq.m suites, and polished marble flooring bathrooms with supremely elegant and actually practical sanitary wares from Italy, matching with vintage taps made in the UK. Such an adornment is hard to find in Bangkok; except in the Mandarin-Oriental best suites, we have never seen such a tasty sophistication in the design of a bathroom. We liked also the balconies, with a view on the courtyard framed by lushly tropical palm trees. We often sat there with a book, feeling like miles away from the animated and noisy Sukhumvit Road. At Cabochon, nostalgia alternates with a peak of high-tech: we liked the complimentary Wi-Fi connection, Cable smart TV, and VoiP/SIP phones. The only hotel providing complimentary VoiP / SIP calls which we visited recently was The Peninsula Paris; the level of comfort and service at Cabochon is close to Peninsula, indeed …at a much more accessible rate. We didn’t get time to enjoy the reputed Thai Lao Yeh restaurant, serving Thai cuisine and introducing the less well-known Chiangmai, E-San, and Laotian fares. The dining room is smart and intimate, and the service amongst the best in Sukhumvit. We experienced the quality of the F&B at breakfast (included in the room rate), served in the plush Joy Luck Club. A name which doesn’t lie: we were lucky to have the joy to sit in the deep red sofas and leather armchairs, feeling like enjoying the secret privilege of the Boodle’s or Caledonian clubs in London. Books and magazines give the place an authentic cultural identity. Thus we found the tables little bit low to enjoy the breakfast in full comfort, the quality of the “a la carte” offer and the selection of small cuts, fruits and pastries at the buffet was remarkable. This is a dreamed place to invite a business partner, and also to enjoy a romance. 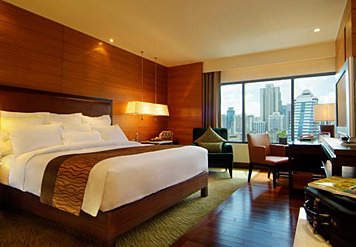 Cabochon is one of the best hotels in Bangkok for a classy honeymoon. We didn’t expect a swimming-pool, as space is scarce and expensive in Sukhumvit. That was a real surprise to find a well designed, straight and long pool, on the rooftop of the residence. Due to the limited number of bedrooms, and as all the guests had left for a meeting or shopping after breakfast, we were the unique users of what was during our stay our very private pool on one of the most exclusive roofs in Bangkok. We discovered the divine Cabochon in the prestigious Secret Retreats catalog: featuring a collection of boutique hotels, intimate inns, and camps, beautifully designed full-service villas, exquisite restaurants, and exotic cruises. SOFITEL SO BANGKOK (*****L): If hospitality were a religion, this cyclopean hotel would be a cathedral. One of the most luxurious and impressive hotels in Bangkok, both in term of volume and services, this brand new Sofitel So is a must-be-seen (and a must-stay!) in the vibrant capital of Thailand where hotels are growing like mushrooms. We became the privileged hosts of one of the Five Elements -Water, Earth, Wood, Metal, and Fire- 238 guest-rooms and suites (up to 138 sqm) inspired by Thailand’s top design firms and an award-winning architect. The “So-Comfy“ “Water” rooms are reflecting sophistication and calm. Designed by Pongthep Sagulku of August Design, those 38 sq.m rooms are actually convenient and not crushed by a more and more generalized trendiness where design harms to comfort. We liked very much the striking view of Bangkok from floor-to-ceiling windows, extending up to the onyx bathtub, in the marble walls connected open-bathroom. We have been impressed by the high-technology provided in this 21st Century room: the lighting is magic, somehow intriguing, but always efficient and so relaxing. The Samsung plasma TV is equipped with DVD player and Apple TV; we used it quite a lot, as the Internet speed was from far the fastest which we ever experienced in Thailand. There is in fact a direct connection to a dedicated broadband server, only for the hotel, making streaming movies on YouTube as fluid as in Western Europe or in the USA. WiFi was also very fast, and complimentary. Those on a long stay, or visiting Bangkok for business, will like to know that browsing is not a frustration anymore. Though we didn't make much use of it, we noticed with satisfaction that the well filled minibar (soft drinks, water, but also peanuts and other small crackers) came also with the hotel compliments. The walk-in dressing-room with lots of storage space and a large safety-box showed, if necessary, that we were staying in a real palace hotel. The hotel is well known by international gourmets and the local hight society for its discerning restaurants: Australian Executive-Chef Paul Smart worked with the chefs of El Bulli and cooked for Her Majesty Queen Elizabeth II. Room rate at Sofitel So Bangkok starts from THB 5,400++ (room only) for a “So Cosy Room“ during the low season, until THB 9,700++ (with Breakfast + Club Benefits) for a “So Club Room“ during the high season. Suites start from THB 11,700++ (with Breakfast + Club Benefits). KLAPSONS THE RIVER RESIDENCES BANGKOK (*****L): Tired of the hotels rooms, and looking for suites fitted for a king, at an unbeatable value for money? 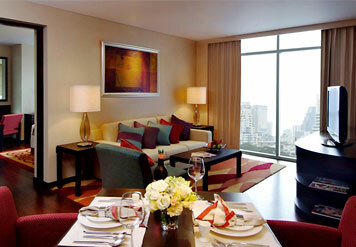 Then this newest, best top ten best-serviced apartment in Bangkok will match your requirement. We stayed previously at the next door Peninsula Bangkok and, astonishingly, found the same comfort and level of service at the more boutique River Residences. Located on the 23rd to 31st floors of the North Tower of The River Condominium, it features a collection of large suites, with a million dollar view on the river Chao Phraya. The 69 innovative units, lavishly crafted by William Sawaya, of contemporary design forerunner Sawaya & Moroni, provide a perception of real intimacy, with a discreet, discerning touch of modern luxury. We loved the “River Suites” at first sight. Large, indeed: 230 sqm, housing three bedrooms (fitting family stay, or holiday with friends), a spacious living room, and even an attached library. The bonus is the view: the immaculate floor-to-ceiling windows, allowing optimal light, encircles the suite; making the guest feeling like embracing the river and the rest of the city. Even the best suites at The Mandarin Oriental didn't provoke such an impression! Each suite has a complimentary espresso coffee machine, large screen Sat TV, and of course WiFi. The hotel has a gym, not less than 5 pools -indeed!- on the 5th floor, with a magnificent well kept garden. Plus one panoramic pool located behind the 23rd-floor trendy lobby: partly covered from the sun, with a breathtaking city/river view, it has a cool salted water, which we found particularly soothing during the hot season. The BTS station Saphan Taksin stands 3 minutes away, using the complimentary hotel shuttle boat. The famous Asiatique riverside restaurants / shopping park can be reached from there within less than ten minutes. Now, the big difference between The River Residences and the other hotels consists in the fact that you can”t book per night, but per period. A 30 days prepaid card, valid one year, makes a five-star suite ridiculously cheap: starting from a little bit more than USD 60 / day... Which sounds the best value ever, in this category, for businessmen on a regular trip to Bangkok. That was our best find of the year 2018 in Bangkok. SOFITEL BANGKOK SUKHUMVIT (*****L): After visiting the so trendy Sofitel So Bangkok, we were curious to compare the quality of this sister hotel, so well positioned in the heart of Sukhumvit. We were expecting a good but austere corporate hotel, and surprisingly enjoyed a cocktail of French chic and Thai atmosphere. One of our top 5 best experiences in Bangkok this year, the Sofitel Sukhumvit, lavishly designed by the architect of the Peninsula Bangkok, reflects the high level of hospitality of a Parisian palace hotel like Le Bristol or Plaza Athénée...at a portion of the price, and with more staff to serve us. Perfectly trained, naturally kind, attentive and smiling, the employees definitely enjoy their job... and their guests (a good mixture of businessmen and tourists). Check-in was a smooth as silk: promptly with the efficient clerks at the main reception desk, or in style if you booked a Club Millésime Floor suite or room. A little privilege, which allowed us to check directly at the very luxurious Club Millésime Lounge. Though relatively spoiled after spending a couple of months inspecting the best of Southeast Asian hospitality, we have been flabbergasted by the swank design of this modish lounge. No “faux pas”, but a sense of detail and comfort making the place actually tailored made for the businessman (we spent much time working there, pampered by the staff) and leisure travelers alike. We liked the selection of magazines and daily international newspapers. The space generously allowed to relaxation and work, the sophisticated “à la carte” breakfast with a French touch, served in style by sumptuous hostesses. The soft drinks, and 100% authentic Italian espresso which we could order anytime free-of-charge. The stylish high-tea with yummy “éclairs chocolate” and macaroons, better than Angelina or Ladurée Paris. The rich “Happy Hours” in the evening, providing gourmet snacks, a nice selection of wines and home-made cocktails to those who, like us, set the alarm of their clock to 6 pm not to miss the event. We sat at the ritziest lounge bar in the Kingdom, enjoying the same level of chic and social life like in real Parisian or New Yorker palace hotel. There are a business center and a nice meeting room which can be used one hour per day with compliments. Last but not least, the circular view from the 31st floor is worth the trip to Bangkok! The 345 rooms are all supremely elegant. We appreciated the carefully waxed timber floor, modish furnishing, and the king-size bed made a comfy cloud: Sofitel is world famous for its legendary “My Bed® “, whose concept is so exceptional that it equips the new Air France “La Première” first-class seats. You can choose your favorite type of pillow from and extended menu. The linen is the finest ever. We could quickly inspect one of the 3 “Opera Suites” and 2 “Imperial Suites”, with terraces. We princely slept in a 60 sq.m two-room masterpiece “Prestige Suite”. Again, we felt very much in a palace-hotel, from the global style, plus small yet noticeable details like the selection of Hermès products in the refined bathroom equipped with TV. There are two other well sized Smart Led TV sets in the living and the bedroom, with a powerful Bose Lifestyle System. The writing desk is actually set for working, with much space and lots of plugs. The Internet is complimentary and fast: no need to pay an extra fee for the “Premium Bandwidth”. The espresso machine is professional. The Club privileges include the dedicated service of a butler, and a so useful late check out until 16:00 pm (subject to prior reservation and availability). Style is everywhere at Sofitel Sukhumvit! Of course, all facilities are here. A SPA, a state-of-the-art fitness club with a very efficient and courteous coach, a large and quiet pool (it is not heated; which is most pleasant during the hot season, and a little bit chilly the rest of the year). This is surely one of the best Sofitel in the world. 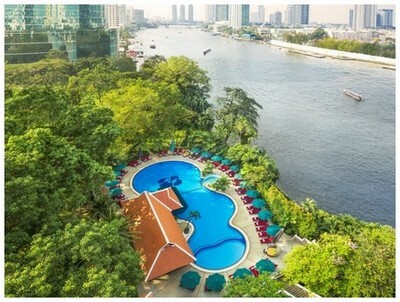 ROYAL ORCHID SHERATON HOTEL & TOWERS (*****L): With 726 rooms and suites, the largest hotel on the banks of the Chao Phraya River remains one of the best addresses in Bangkok, after three decades, and despite the opening of dozens of luxury competitors. A non-stop success for this fairly priced hotel, always crowded with those expert travelers knowing that there is no more exciting place to stay in Bangkok than the riverside. The BTS Taksin station (Silom line) is accessible within less that 10 minutes aboard a stylish complimentary shuttle boat, which we used many time for the pleasure of cruising on the exotic Chao Phraya. Chinatown is located almost next door, wandering in an undiscovered, still authentic part of the city, which the Royal Orchid Sheraton likes to show to his visitors: its lanes, animated by local street-food vendors and friendly inhabitants living exactly like if Bangkok were still a Siamese village, all drive to the neo-gothic Talad Noi’s Holy Rosary Church. Erected in the 19th century, this Portuguese-Catholic is a splendor! The Siam Commercial Bank colonial building is not far. If shopping is your passion, the recently beautified River City is the ideal mall to find luxury fashion items at a good value price. It has also a lot of restaurants and riverside terraces. There are two ways to discover the cyclopean Royal Orchid Sheraton. The first one, consisting in mixing with the flows of tourists, can be exciting: particularly at breakfast time, when the F&B team do the noteworthy record to seat and feed hundreds of guests! We surprisingly got a table within a couple of minutes, and didn't queue at the generously supplied food stations. The second one, which we recommend, is to make it in style. Booking a Club Room, feeling pampered the palace-hotel way, with a boutique touch. Located on the highest floor, with a memorable panorama over the river, the Sheraton Club Lounge makes Bangkok look magic at sunrise (breakfast time) and sunset (snacks and cocktails time). Access to the Club privileges starts at check-in, managed as quickly as courteously. We arrived a little bit after 2 pm, and could immediately engage in the afternoon tea, served with cakes and canapes. We couldn't miss the 5:30 pm to 8 pm cocktail, with a rich selection of hors d’oeuvres, wine from the New World (French wine was out-of-stock during our visit: showing that the Club lounge are distinguished connoisseurs...), and liquors from the leading brands worldwide. We liked the top-quality breakfast served in an intimate atmosphere by well trained staff. A variety of international and local newspapers and magazines is on display. Business guests can use the Club Boardroom, 1 hour per day. All complimentary, of course. Located on the 25th to 28th floors, the 36 sq.m Club Deluxe Riverview Rooms showcase outstanding views of the Chao Phraya from floor-to-ceiling windows. We would just come back to the Sheraton for this million dollar panorama. Bright, with a trendy warm earth tone design, they have a ritzy marble bathroom providing all the imaginable toiletry a globe-trotter with a light bag might need. The safe is actually quite particular: located in a drawer, opening from the top. We didn't use the tea and coffee facility, as we preferred the excellent espresso from the Club Lounge. We liked the complimentary laundry/pressing services, with a generous allowance of three pieces per person per day. The hotel has two pools. Sports swimmers will prefer the saltwater terrace pool. Yet the hotel main attraction remains since decades its amazing garden pool, surrounded by tropical greenery hosting a family of peacocks! This looks like a little, unexpected Heaven! After swimming, we enjoyed the superbly equipped Fitness Club (with a tennis court). We had not time for the Mandara SPA, reputed one of the best in the city. 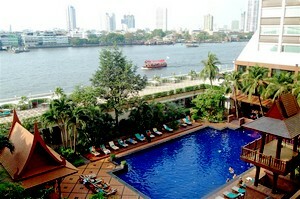 The hotel houses four riverside restaurants, highly popular among Bangkok residents. Italian, Thai, Asian and International/BBQ cuisines are all excellent. We had a palatable, al fresco seafood experience at the chic and sleek Riverside Grill. Fair bill and relaxed atmosphere. Supremely attentive service, like everywhere in this caravanserai of luxury. We have undoubtedly been positively surprised by VIE Bangkok: introduced as a boutique hotel, it has all what one might expect from a small, intimate property; plus all the advantages of a large palace hotel. With 154 rooms and suites, spacious in any category (38 up to 420 sq.m), featuring super high ceilings in the splendid Duplex Suites, the VIE doesn't look like that much boutique from outside; but once in the zen and human-sized lobby, the homey atmosphere popped up, and we felt so much pampered by the staff that, yes, indeed, boutique is a proper word to define this refined hotel managed by Accor, but owned by a local family which cares on each detail to make it looks like all but a chain hotel. We have already visited some M Gallery Hotels by Accor; VIE beats them all in term of luxury, and already received many awards (Best Boutique Hotel by AsiaRooms.com, “Trendy in Asia” award by Tripadvisor Traveler’s Choice Awards, “Best Newcomer in Bangkok” by Wotif.com, “Best Urban Hotel” by Anywhere Magazine, etc). We had been booked in a spacious suite. While many Western hotels like to describe and sell large rooms as “Junior Suites”, VIE renamed on the contrary its comfy and chic 81 sq.m suites as rooms (“Grand Deluxe One Bedroom with King Bed”)! We therefore got much more than what we would have expected. Large living room with deep sofas and large writing deck, Panasonic flat screen TV in both living room and bedroom, super king bed with a nice selection of pillows, ritzy bathroom with Aigner toiletry; and everywhere that trendy, warm design reflecting a unique sense of hospitality. Lots of wood, leather, silk and fine cottons. Original drawings and artefacts everywhere in the rooms and public areas. And a quiet, relaxing atmosphere, though the VIE is located in one of the busiest and most sought after part of Bangkok: just opposite BTS Ratchathewi station, a short walk (or complimentary hotel “tuk-tuk” shuttle ride) to MBK, Siam Paragon, or Central World. Silom, Sathorn, Sukhumvit and the lovely Bangkok riverside area are just a few BTS/MRT stations away, connecting to rail link to airport. Room rate is attractive (you might like to choose a special package) and includes high-speed WiFi. Chef Jerôme Chautard caters hotel guests, and visitors from outside alike, with his mouth watering Provencal style cooking. Originated from the gourmet city of Bourg-en-Bresse, trained in Saint Tropez, he brought a lot of his soul and much of his skill to the La VIE Creative French Restaurant. Breakfast (one of the best in town), lunch and dinner are buffet style. Jerôme is always very much available in the room to guide the dinners through the Epicurean selection of the finest oysters, king crab legs, foie gras, Cordon Bleu, fresh fish, superb pastas, plate of traditional French cheese and light imaginative deserts. At about EUR 20 for dinner buffet, this is one of the best value five star restaurants in Bangkok. We really liked that much attended and popular place, and understand why it received the merited “Thailand’s Best Restaurants 2010, 2011, & 2012” award from Thailand Tatler Best Restaurant Guide. Alternatively, VIE has also a nice coffee-shop by the lobby, and a Japanese restaurant. There is a night bar with lounge music also. Leisure are taken in serious consideration. The roof pool is pleasant and quite unique with a glass bay giving the impression that you swim up to the street. Relaxing in the cool water, observing the peak hours traffic jam and people running to the metro, is a selfish, though quite exciting pleasure... After a warm Jacuzzi in the well appointed fitness centre, we recommend a massage in the luxurious treatment rooms suites at VIE Spa. A one hour Thai or oil massage, performed by really kind and experienced professional masseuses, is worth every penny of the good value rate (about EUR 50). We found the place almost as luxurious as the Mandarin Oriental Spa, and the staff exquisite. Surely one of the best five star hotels in Bangkok, it might have one competitor in Thailand in term of exclusive top class luxury: The V Villas in Hua Hin... owned by the same company, and also managed by Accor. By contrast, the 303 rooms (including 42 suites), as well as 98 serviced residences, look like a homey, actually relaxing retreat. Matching the high standard of the hotel: with a hip, contemporary interior, warm parquets, high walls covered with precious wild silk, fabulous king-size bed, balcony with garden & pool view... And certainly the most spacious bathroom downtown: so large and richly appointed. «Boutique» by the design, palace-hotel by the concept, we actually liked our Deluxe Room: featuring a large LED flat screen with video on demand, Internet radio and media entertainment system, iPod connectivity, complimentary LAN and wireless broadband internet. As a bonus, all the items in the minibar (mineral water, soft drinks and beer) were provided free of charge; just like the Lavazza Expresso capsules for a premium coffee facility! If luxury is not enough, just book one of the Cabana Rooms, displaying private terrace overlooking the garden with direct pool access. Executive rooms and suites guests can enjoy the privilege of the exclusive Executive Lounge. Opening offers and packages are available at fair price. Though we didn't experience the restaurants yet, judging from the extraordinary quality of the breakfast -one of thee finest ever enjoyed in Thailand- they must all offer splendid dinning. Which sounds like a necessary challenge: right in the heart of Bangkok, the hotel is surrounded by the best restaurants, and the high end Siam Paragon shopping mall, with plenty of gourmet resources, is located next door: an anticipating, elegant security guard will even stop all the cars to make you cross the street safely! Isn't it a five star service!? Needless to say that we warmly recommend this remarkable palace-hotel. THE PENINSULA (*****L): Since almost a couple of decades, The Peninsula Bangkok offers to the traveller a splendid riverside alternative to the legendary Oriental. Both hotels are facing each others: without the river Chao Phraya as a border line, sure a merciless war should had broken out already. Such a concurrence is a splendid opportunity for who is looking for superlative service and comfort in Bangkok. According to us, The Peninsula quickly took the post position: it will do its very best to keep it. While The Oriental is located in a much congestion area, which is inconvenient for businessmen, The Peninsula stands on the Thonburi side of the river: traffic is still OK there, and the highway is accessible in a few minutes. There is a private pier and river shuttle, with check in/checkout facility on opposite bank. The lobby is palatial. Some find it quite cold; personally, we loved it distinction at first sight. The staff is extremely courteous: which is quite normal in a five star deluxe hotel in Thailand. One of the most impressive difference with other hotels of this category comes with the brand new Rolls Royce Silver Spur II, available for glamourous and top comfortable transportation (THB 1,800 per hour, inside Bangkok). 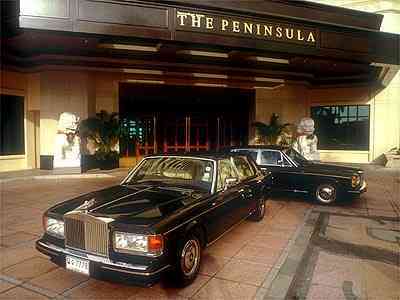 The Dusit Thani used to have its Silver Shadow II fleet, but unfortunately stopped the operation five years ago. Distinctive travellers will hear with pleasure that the Spirit of Ecstasy is back in Bangkok ! The pool is a long and straight one, with some waterfalls: we like its design. The pool side is much pleasant: very tropical, with a its private “khlong“ (canal), and small lake with a Thai Sala. The fitness center is one of the best equipped and luxurious in Bangkok. It is equipped with Californian work-out equipment, and has a very pleasant hot tub. Of course there is a sauna, and all the basic facilities one could find in any international hotel. Fitted for VIPs, The Peninsula has its own helipad. Only the Shangri-La can compete with it on this matter. Before flying over Bangkok, the passengers can have a drink in the very high tech and intimate Paribatra lounge. We enjoyed the place very much, with its aviation related decorative items. We had delicious Dim-Sums, Egg Noodles with Seafood and Moon Cakes at the Mei Jiang: The Peninsula relaxing and smart Chinese restaurant was full the day of our visit. Excellent service: they even get some kind of a sommelier... specialized in tea ! The Cilandro is serving Thai specialities. For lunch, it displays a superb international buffet. There is a terrace for outdoor evening barbecue. Such a luxurious place should have its French restaurant; it does not. As there is the top famous Normandy, at The Oriental, the management certainly preferred to offer a more relaxed alternative to smart dinners: with Jesters. There is some Philippe Starck's influence, indeed, in that trendy room, decorated with aluminium, painted steel, and high tech furniture. A large window faces the river. There is a live band. By night, it may be extremely romantic to have a candle light dinner there. They serve “Pacific Rim“ cuisine: we still ignore what it means... More details will be provided after our next inspection. Part of the PENINSULA GROUP OF HOTELS. RAMADA PLAZA MENAM RIVERSIDE BANGKOK (*****): One of the most pleasant, and definitely the most affordable riverside hotels in Bangkok. This lavish, yet family friendly five star hotel, managed by Ramada since 2008, offers an international quality of services in an authentic Thai atmosphere. It has one of the kindest and most anticipating staff in town. Nothing changed since our previous stay! We have been called by our name, each of our request was welcomed with a smile, and some small yet noticiable details made this well managed hotel (GM Klaus Sennik worked many years for Intercontinental) a discounted alternative to legendary hotels like nearby Mandarin Oriental: a glass a cold water and fresh towels presented over a silver tray to exhausted passengers on the shuttle boat on a canicular day is a kind attention that we noted only from one hotel in Bangkok: Ramada Plaza Riverside! The 525 rooms and suites (featuring 23 rooms for disabled guests) have been designed classically and pleasantly. We felt like the practical American comfort, with a subtle Asian touch. Our Club Room, located on the 16th floor, overlooked the pool, allowing a breathtaking river view. Rooms have twin or king sized bed, coffee / tea facility, a large working desk, and are all en-suite with bath and separate shower. There is of course LCD Sat TV with indeed many western channels, a digital safe, and free high-speed WiFi. 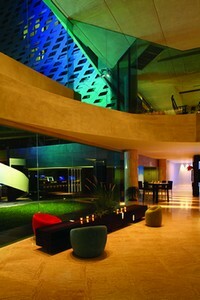 Besides the service and location, what makes us come back to this ideal hotel is the new Executive Club Lounge. One of the best which we have experienced in Bangkok, it occupies the two top floors and has a unique river and city panorama. Club Rooms, Plaza Suites and Terrace Suites privileged guests can enjoy private check in / out, a refined privatized buffet breakfast, an elegant high-tea with a selection of cakes and canapés, and a much attended evening cocktails with quality imported wines and five-star “tapas“, fruits, and pastries which could replace a dinner at ease... There is a pleasant, well equipped boardroom which clients can use for a business meeting 1 hour per day. In-room bonuses feature daily fruit basket and fresh flowers, privilege laundry/pressing services, city calls, turn down service, shoe shine service, and a most appreciated late check-out. All complimentary. Last but not least, Executive Lounge guests receive attractive discounted F&B offers. This lounge looks like Paradise in a paradisiac hotel! Just like the lovely Terrace suites, the Presidential suite, located on the 16th floor, offers spectacular views of the river Chao Phraya from its large terrace, equipped with a private Jacuzzi. With two bedrooms, a large lounge and dining area, it is a very enjoyable for romance or business. Eight restaurants and bars complete the warm, friendly ambience of the Ramada Plaza Menam Riverside Bangkok. Using fresh local ingredients, plus some imported delicacies for a finest cuisine, all of them apply a very reasonable policy in term of price: much cheaper than what one could expect in a luxury hotel. The new Eurasian Grill caters a high-end clientele, and the Ah Yat Abalone Forum Restaurant is well known for Chef Yeung Koon Yat's Hong Kong style cuisine, specializing in abalone. Our favorite bar is the romantic, cool Terrace@72 Restaurant & Bar: with its illuminated bar and chairs located in the open air, along the river. This is where we enjoyed one the best breakfasts in Bangkok (with a great Thai, Chinese and Japanese food corner): though serving more than a thousand guests every morning, the staff always recognized us, remembering perfectly that we didn't like American coffee but double espresso. Extremely busy to serve everybody promptly, we always had a short discussion with a kind word from part of the anticipating head waiter. We had an inspection stay at the Mandarin Oriental after experiencing the Ramada, and the service and ambiance at the river terrace was quite similar (thought much more pricey at M.O). Service in the room was first class also: our kind maid inquired each morning and evening about any special request. The reception staff -and particularly the female concierges- was extremely kind and efficient. Five star, indeed. We crossed by the GM almost all the time in the lobby, taking care personally of his guests, VIP or not. There is a well appointed wellness & SPA, and a large pool which is not so much oriented to the sun, with quite cool water: so refreshing during the hot days, and ideal for children (and Asian guests, disliking sun-tanning). Those preferring «farniente» can use the spacious and airy sun-deck, with many beds along the river, just close to the pool. The riverfront is developping quickly with new, amazing projects. Making the hotel location definitely strategic. Away from the noisy downtown districts, it offers an enchanting seven minutes complimentary pleasant cruise, aboard the complimentary hotel shuttle-boat: transporting you in style to the Taksin Bridge BTS sky-train station and public speedboats station. Making all the attractions, shops, and business a few minutes away from the hotel: avoiding the stress of the terrible traffic jams which participates in the infamous reputation of Bangkok. Moreover, the hotel stands in a very authentic, safe and friendly area which is well worth the exploration, away from the tourists paths. You will love the small temples, fresh fruits and flowers sellers, and the old Chinese shops all around. Last but not least, the new and so entertaining Asiatique Riverfront mall and night-market, with lots of inexpensive and good restaurants, is located next door! Rates vary according to the season. A Deluxe Room with breakfast costs about THB 4,000 in the low season, till approximately THB 6,000 in the high season. Exciting packages and special offers apply. This remains since many years one of our favourite addresses in Bangkok. CHATRIUM HOTEL RIVERSIDE BANGKOK (*****): Being permanently ranked among the Top 20 best hotels in Bangkok by Tripadvisor should be enough to attract any traveler looking for luxury and top-quality. The Chatrium Riverside, which we experienced three times already with an increasing pleasure, is one of the most impressive hotels in South East Asia. The location of this 36-story tower, with an elegant progressive architecture, is unbeatable: right on the bank of the River Chao Phraya. Allowing a sweeping view of the «Menam» and the «City of Angels», from the oversized windows of the 396 rooms... which are actually lavish suites, covering from 60 Sqm. for a Deluxe Room, until not less than 460 Sqm. for the largest Presidential Suite in Bangkok. We booked a 120 Sqm Two Bedroom Chatrium Suite, which was perfectly suitable for a family stay. Just like all the suites, it featured a spacious balcony, floor-to-ceiling windows that afford optimal light, four-fixture bathroom with separate tub and shower, fully-equipped kitchen, and dining table. The beds are amazingly smooth and top-comfortable. Chatrium Suites features three zones, each with its own unique style of accommodation: Grand Floors (7-31), Executive Floors (32-34) and the Premier Floor (35). The outdoor Olympic-size swimming pool on the 6th floor, with a pleasant and romantic river view, is easily accessible from all floors. Guest of the Executive Floor and Premier Floor are entitled to the exclusive «Club» complimentary privileges: breakfast at River Barge Restaurant or in the stunning «Chatrium Club Lounge», in-room hi-speed internet connection, one-hour use of the meeting room in Business Center per stay, laundry service for 2 pieces per day, late check out until 6:00 pm, and use of the club lounge on the 36th floor. Tailored-made for the distinctive traveler, the recently upgraded «Chatrium Club Lounge» also hosts the Business Center and boardrooms: it offers VIP breakfast, all-day refreshments, and evening cocktails with canapés from 5pm to 7pm. A great place to socialize with the other guests! We like very much the «Chatrium Club Lounge» philosophy, and our personal experience through the years confirmed how well the Chatrium Riverside controls the concept vs the competitors. Though, you don't need to be an executive guest to enjoy the splendid service which participates in the prestige of the Chatrium Hotel Riverside Bangkok. We have been systematically called by our name by the staff, which is actually 5-star: from the security guard checking our taxi fare upon arrival, just to make sure we had not been cheated by the driver, till the extremely active and efficient room-division manager, we found so much kindness and respectful hospitality in this hotel! This was a good surprise, as the Chatrium is large and new. Two factors which, normally, do not facilitate a personalized service. It took short time to train the staff to a supreme efficiency: making the guests feeling perfectly at home. The breakfast, served in the River Barge restaurant, with its curved windows overlooking the river, is delicious. Note that it features plenty of Asian (Thai, Chinese and Japanese) delicacies. The place is very popular for its international cuisine and regional specialties buffet-style and à la carte. We had a great Sunday Brunch at Silver Waves: located on the 36th floor, this chic Chinese restaurant features authentic Cantonese cuisine served in a setting that affords breathtaking 360-degree panoramas views of the cityscape and the river. The selection of Dim-Sums is almost unlimited, and the quality is high end... for less than USD 20. The professional fitness-club is richly equipped with the lastest instruments available on the work-out market. Impressive! Another bonus is the classy, vintage teak-wood shuttle boat, linking the hotel with a too short -5 minutes- river cruise to/from the Taksin BTS - SkyTrain Station: assuring that all points of the city are within reach. This five star hotel remains amazingly good value for money, with attractive rates and regularly updated promotions. Designed expressly to meet needs of discerning business and leisure travellers, the Chatrium Hotel Riverside Bangkok is the new, and certainly the most brilliant, gem in the legendary Thai five star hotel industry. JW MARRIOTT BANGKOK (*****): Awarded as one of the Top 50 Hotels in Asia 2007 from Travel & Leisure, with a remarkable location in the business and commercial (prestigious shops, night market...) Sukhumvit district, right in the city center and well deserved by the Sky Train, this is one of our best tips in Bangkok. The hotel took the best from America (excellent security, high tech everywhere, huge rooms...) and Thailand (palatial lobby, Thai design and superb service). We stayed in an Executive Suite: fairly well appointed, with deep sofas, CD player, a panoramic plasma TV in our large living room, plus a a 32 inches flat screen in our bedroom. The king-size bed was extremely comfy, with down comforters and custom duvets, and the bathroom large enough to accommodate a family... From the razors to the toothbrush or talc powder: nothing was missing in the extended toilet kit provided to the guest. All rooms feature tea and coffee facility and ironing board with a steam iron... Which we found very useful for a quick pressing of our jackets. Last but not least, the panorama over the city was fantastic. This five star environment is completed by a top comfortable Executive Lounge; its access is actually limited to a very limited number of happy few, and we immediately felt at ease there. This is the place for breakfast and complimentary drinks and snacks. There is high speed WiFi also: a pleasant place to work and communicate, indeed. Now, what actually makes the difference with other hotels is the breakfast, in the Marriott Café: we enjoyed it so much! The location if bright, pleasant, with a lot of families. You don't feel like in a corporate hotel (but is it so?). The buffet is gargantuan, with a variety of delicacies we found nowhere else in Bangkok. From the Scottish salmon to the Italian sausage, from the French « pain au chocolat » to the bagel, with a wonderful Asian corner (great Dim Sums and fried noodles with tiger prawns...). This is what would make us come back again, and again. The price of the breakfast, included in the room rates with some packages (or if you stay in the Executive Floor), is a great value for money. The impressive quality of the F&B comes graduating in the New-York Steakhouse, Man Ho Chinese Restaurant, TsuNami Japanese Teppanyaki Steakhouse (with all sorts of Saté and rare kobe beef), and White Elephant Thai Restaurant which are all very famous in Bangkok, and very much visited by expats and prominent Thai personalities. We also appreciated the express check-in and check-out, the very friendly and efficient concierges (the head-concierge is a « Clef d'Or », and can solve on the spot any problem the guest might encounter with the somehow sophisticated in-room high tech equipment), and the way the hotel staff cares about you security, even after checking out (taxi reference is taken, in case of any problem with the fare or lost item!). Price for a double deluxe room starts from THB 6,900 THB ++ to THB 8,000 ++. A remarkable hotel, well worth the stay. LEBUA AT STATE TOWER (*****): Extraordinary, extravagant, exorbitant... the easiest way to review such a hotel would consist in concentrating superlatives. This is the place where each detail, each movement, each word has been thought up carefully to please much spoiled -though amazingly young- guests, conviced that they had already visited the best hotels in the world. The Lebua makes them change their mind... It took just a few years to build a universal reputation, rank atop, and get unanimous reviews in the medias worldwide. The tallest five star hotel in Bangkok? The most impressive concentration of staff we have ever seen? The largest rooms (which are all suites)? The highest terrace-restaurants? The most expensive dinner ever served in the World (at 1 million US$ a head!!!)? There is only one reply to this quiz: Lebua! The hotel extends from the 47th till 65th floors of a cyclopean neo-classic sky-scrapper, located right in the center of Bangkok, between Silom Rd shopping district and the Chao Phraya River. The lobby is warm, intimate: it made us feel like in a small luxury hotel: which the Lebua actually is, with only 198 suites. Our Three Bedroom Executive Suite was palatial,, with 266 Sq. M fitted for a king. Our check-in took place in the «intimacy» of a living-room which could host at ease a private party (which sometimes happens, when guests require a private in-suite chef to take care of their gastronomic entertainment! ): it was flanked by a service kitchen, with a large refrigerator and all the kitchenware adapted for premium cooking sessions... Another particularity: we were kindly asked to sign up a discharge before we got access to our large, round shaped balconies with a stunning view of the Chao Praya River and the whole metropolis... Who would commit suicide, being already at Heaven in this dreamed hotel? The design of the suites is modern, trendy with large tables and sofas, elegant parquets and fine carpets. The king-size beds are as smooth as silk, with sweet linen and duveted mattresses. There is a Sat TV in each room, with DVD, and complimentary high speed broadband Internet. We liked the spacious marble bathrooms, with top quality Bvlgari amenities. This glamorous atmosphere infuses a restful relief from the hot glare of the city. Service is anticipating and so discreet: we have never been disturbed, though the movement was permanent once we left our suite, which was cleaned many times a day, and generously provided with fresh fruits, fine chocolates and snacks... Each morning was a delight: the Buffet Breakfast was sumptuous. We recommend the Dim Sums and the Sushis. It is served at Café Mozu (a place for belly dancing, each evening, in an atmosphere which remembered us the Buddha Bar in Paris), by one of the best trained -and beautiful- waitresses in Bangkok. They call each VIP -which means 100% of the guests!- by his name, and remember by heart any personal taste and requirement . The hotel pride remains The Dôme: located at the 51th-65rd floor, this is a congregating of fine dining scenes under one roof. We had a wonderful gastronomic experience at Breeze. Seating in the open-air terrace, close to the stars, with a bird's eye glimpse of Bangkok. This multi-awarded restaurant, has been designed to revolutionize the Asian style seafood-dining, The steamed jasmine rice, mixed with abalones and lobster meat, and the Dim Sums are just sumptuous! This is, with Sirocco, Mezzaluna (the best Italian five star restaurant in town), Distil and the Sky Bar (unforgettable: perched on the 63rd floor), the only restaurants and bars in the Kingdom of Thailand recognized by Conde Nast Traveller 2005-2007. There is a pleasant Mezzanine floor open-air pool with Jacuzzi, a large Fitness Center with the ultimate equipment and kind coaches, and one of the most competent concierge in town offering very special services: like staff welcoming you directly at the plane, guiding you through the immigration and luggage processes, while a comfortable air-conditioned limousine with a uniformed driver awaits for you at the gate... Such is Lebua, and such we loved it! Rates are variable, with attractive money saving luxury packages. The Lebua at State Tower is a member of Preferred Hotels & Resorts. Don't go to The Lebua to see Bangkok; go to Bangkok to see The Lebua! RIVA SURYA (****L): Modish, awesome, cool, trendy, but affordable: how comes we didn't know this riverside boutique hotel sooner? A chic dinner aboard the Supanniga boat, parking at the hotel pier, was the starting point to our discovery. The so unique location, the inventive design of the building, the pool which gives the impression that you are swimming in the Chao Phraya river... We had to spend a few nights in this four-star luxury getaway, indeed! Far from the hustle and bustle of the city, Riva Surya is ideally situated close to The Grand Palace, Wat Pho and Wat Arun. It takes less than five minutes to order a speedboat for an excursion along the picturesque “khlongs” (canals) of Thonburi. We liked to stay in the preserved, quiet and exclusive environment of this hotel, then venturing after dark into the touristy and badly cheap streets of Khao San Road. Though we have never been fans of this neighboring backpackers area, we must admit that some pubs and simple BBQ restaurants are quite atmospheric...before getting back to sleep in the luxury of our hotel! 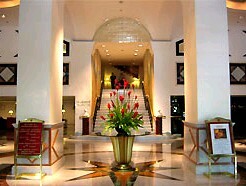 This was always a pleasure to enter the appealing lobby after a long walk, greeted by the young and enthusiastic staff, and have a cocktail at The Garden or Mezzanine Bar, by the cool and so tempting riverside swimming pool. The hotel is actually worth for its riverside activities: like the gourmand breakfast (we liked the dim sums and the large choice of tropical fruits), and breezy dinner making us feel like on the deck of a cruiser. The Babble & Rum Restaurant serves a reasonably priced Thai cuisine, based on fresh, local organic ingredients, in the rustic atmosphere of a market-inspired dining area. Seafood and western dishes are also proposed in the extended “à la carte”, with always a lot of promotion and daily offers. 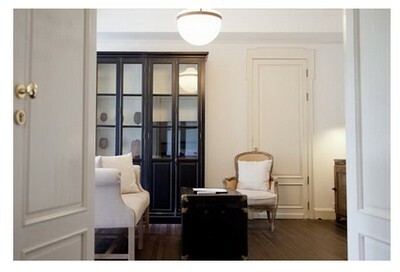 The 68 rooms are refined and homey. Book a river view: the “sala” terraces are definitely unique. They are the closest to the Chao Phraya in all Bangkok. We felt like staying on a ship, indeed: with the non-stop animation of the “Menam” just opposite our sofa. We stayed in the best riverside hotels, but none can compete with Riva Surya in term of proximity. 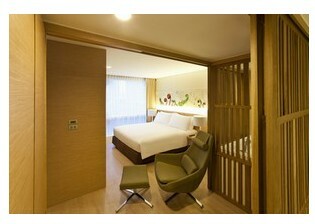 Besides the stylish design and location of the hotel, this is what would make us come back without hesitation. The 40 sq. m Deluxe Riva Rooms and 48 sq. m Premium Riva Rooms are superb, with a perfect touch of each detail: five-star bathrooms, 400-thread count bed linens, entertaining system featuring LCD Sat TV and iPod docking station, and nice looking contemporary Siamese furnishings. Very boutique! Very chic, the Riva Surya is tailored made for honeymoon or wedding. One of the most precious boutique hotels in “Venice of the East”, this is the pearl in the SNH Collection. PRAYA PALAZZO (****L): We try to find out the convenient adjective to express our impression after our stay in this hotel; if “unique“ were not so neo-marketing nowadays, this would have been the ad hoc word. There is no place like that elsewhere in Bangkok. We can't even call “hotel“ this residence, built in 1923, by Colonel Praya Chollabhumipanic: a Thai-Chinese millionaire and nobleman who worked closely with King Chulalongkorn. The “Ban Bang Yee Khan” (former name of the Praya Palazzo), last mansion of that kind surviving along the river banks, has lost none of its soul after a complete and faithful restoration, opening to the public in 2009 as a landmark of hospitality. Everything goes different with the Praya Palazzo: our first contact with the hotel was... a boat. This is a delightful contrast, proceeding from the modern Suvarnabhumi International Airport and suffering the legendary Bangkok traffic jams, to have a vintage, beautiful river barge waiting for us at Phra Athit Pier, and to be presented with a well poured flute of chilled cocktail, and fresh perfumed towels over a silver tray! The palazzo is located on what many people like to call “the other side” of the river (actually Thonburi). It takes a couple of minutes to cross the Chao Phraya with a memorable view over the gilt temples, modest houses still surviving on both embankments, and the cyclopean and modern Rama VIII bridge. You are in Siam, much more than in Bangkok! An island of serenity and luxury, the palace distinguishes itself from the environment. Impressive at first sight, it looks what it should hopefully become sooner or later: a Relais & Chateaux. Definitely different, it has no reception (just a small administrative office), and check-in is made in the discretion of the room. We booked in the “lowest” category: thus, our Superior Room was actually charming and looked indeed larger than the 25 sq. m. published in the Praya Palazzo homepage; this impression of fair volume came from the high ceilings and good design of all the guest-rooms. The comfortable bed and the subtle furniture are antiques. Some rooms even get a black Bakelite 1940's dial phone and furthermore hunted items from the past. Some bathrooms have old, plush tubs; some look more modern. All rooms and suites are different; guests should make up their choice in the photo-gallery according to their preference. Is it an advantage or disadvantage? ; some of the 17 rooms and suites, like ours for instance, don't have a river view; they are the quieter ones, as the traffic on the Chao Phraya can be sometimes little bit noisy. Of course, the river view is more romantic for couples and honeymooners. The Praya Palazzo is one of the best choices for them, with the Mandarin Oriental; in some aspects, this colonial residence reminds us so much of the Old Wing at the certainly more ritzy and much more expensive Mandarin Oriental Bangkok. In both places you indeed feel somewhere! 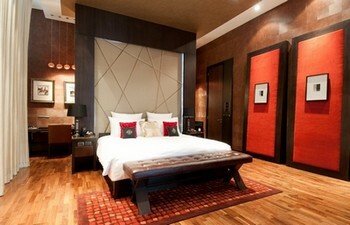 Moreover if you booked in one the suites, which are not so pricey. The high end 45 sq. 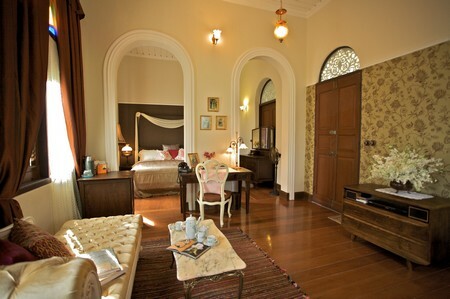 m. Chao Phraya Suite reflects a early 1900's atmosphere: it has a splendid living room, and it overlooks the Chao Phraya. All the rooms are equipped with 29'' till 32'' LCD Sat TV, CD/DVD player (a selection of movies is available, for free), complimentary tea/coffee facility, a safe, and fine Harnn bath amenities. WiFi is unlimited and free-of-charge, in the rooms and public areas. Rates start from approximately USD 140 for a Superior Room up to USD 500 for the Chao Phraya Suite, depending on the season. Many Thai and foreign residents in Bangkok come only to enjoy the restaurant. We found it is so stylish and romantic: with its gallery displaying old sepia pictures of the palazzo, its small library where you can read or borrow some books (again, just like in the Old Wing at the Mandarin Oriental...). Last but not least, the cuisine is delicious. We experienced some of the Thai chef's specialities, like the deep fried river prawns with red curry sauce, or the fried scallops with black pepper, and this was all yummy. USD 20 is an average bill for a good lunch or dinner with one glass of local beer or two: this is more than reasonable in a four star deluxe hotel. The service is classy, anticipating and kind, just like everywhere else in the residence. The lush gardens all around the hotel, with pounds haunted by frogs, fishes and tropical birds, extend up to the large swimming pool by the river. The Garden of Eden! Now, some might be little excited, but maybe also worried by the position of the Phraya Palazzo. You are in something like a peninsula of privacy and relaxation, in the middle of a totally amok city. Everything comes at a close reach: the Grand Palais, National Museum, Royal barges Museum, Wat Arun, Wat Pho, Chinatown, Khao San Road (plenty of cheap restaurants, massage parlours and shops: very funny by night)... But you need to use the hotel boat. We stayed three days, and never got any problem with it. The crew is friendly and serious. You will be given a phone number (soon an intercom will be installed at Phra Athit pier): call it, and after a couple of minutes you will see the boat leaving the opposable bank, just to catch you personally. Night owls might dislike the fact that the service is usually interrupted after 12pm; but those who would like to enjoy Bangkok much further after dark can simply pass the word to the reception, and the crew will stay in duty just for them. What else?! 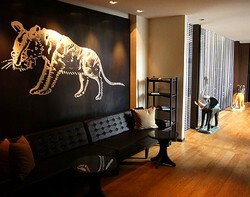 One of the most lovable hideaways in Bangkok, where guests want to return. LIT! (****L): Operating since 2011 and permanently on the top of Tripadvisor, this cool boutique hotel combines the international luxury of a four star superior hotel and a bewildering colorful design with a Thai influence. A rare, attractive concept, with one of the best locations in central Bangkok: just off the hip Siam Square, opposite MBK (our favorite shopping center in Bangkok! ), with a quick access to both Rachatewi and National Stadium BTS - Sky Train station (making Sukhumvit, Silom and Riverside areas a 10 till 15 minutes trip). The 79 rooms and suites concentrate what any leisure or business traveller is looking for in Thailand: superlative facilities, and authentic hospitality with a smile and lots of anticipation. Visiting the Lit! homepage, promotions are extremely attractive for the Extra Radiance Rooms: discreetly designed to welcome in an abundance of natural light whilst preserving privacy, they are a good introduction to the Lit! supreme comfort. Superior categories of rooms, -Different Degree Rooms, Full Spectrum Suites, Triple Luxe Suites- barely more expensive, are equally comfy, though more spacious. We would recommend the very practical Triple Luxe to families, as it is features three queen-size beds, two sinks, and two TV sets. The minibar is not cheap, but it includes a THB 111 complimentary daily credit: which is fine for those limiting their consumption to a coke or a soft drink. The bathroom comes with a relaxing lounge lighting (we showered in blue water! ), and is separated by a curtain. The warm intimacy of such a design will please very much couples, and the Lit! looks a dreamed place for honeymooners, indeed. The hotel numerous facilities feature a stylish swimming pool, an elegant steam-bath designed in the Turkish style, the already reputed Kiriya SPA, and fine dinning though informal funky restaurants. The Fiesta Steppe juxtaposes a series of gently inclined terrace-like decks: bringing guests a uniquely relaxing space that has its own vivacious vibe. It serves up healthy cocktails, and light snacks in a fun and festive atmosphere. The cosy BCDE (Bistro of Creative Drinking and Eating) serves a cornucopia of modern and yummy interpretations of simple Thai and international dishes, with attractive wine pairing. It has the very unique particularity in Bangkok to propose surprising specialities of drinks and meals prepared with flowers as a main ingredient. This was the first time that we ate roses fried in tampura: delicious with a glass of sweet and fragrant hibiscus! The Lit! is lovingly and efficiently managed by the company owning the remarkable Let's Sea Al Fresco Resort (one of the very best hotels in Hua Hin), providing a daily shuttle bus to / from this superb royal seaside resort. MA DU ZI (****L): One of the most surprising, highly sophisticated small boutique hotels in Bangkok, located at the most vibrant intersection of the extravagant Sukhumvit area, Ma Du Zi comes with a touch of glamour, lots of luxury, and the intimacy of a family run property. Almost opposite the exit gate of both BTS and MRT metro station Asok, surrounded by banks, shopping malls, chain hotels and clinics (Asok is well known for its myriad of dentists and plastic surgeons), the low rise, modern building hides itself behind the closed gates of Heaven. Once in this sanctuary of luxury and tranquillity, stress suddenly vanishes and life passes by more slowly and peacefully. The seven floors are not numbered, but lettered by level M, A, D, U, Z, I... We stayed U5, in a “79 Suite” (with reference to this 79m2 corner room size). There was a walk-in closet for our luggage and clothes, like in a grand hotel, and a large working desk covered with Italian leather and fully equipped with Free WiFi Internet connection (good speed! ), Fax/printer/copy machine, and IP Phone. The equipment is so hi-tech, that the management issued a manga explaining how to deal at ease with the entertainment tools (42'' NEC plasma TV, Ipod dock station, CD/DVD with Bose surround sound speakers...), the professional “Francis!, Francis!” espresso machine using real beans for a real coffee (we started to get fed-up with Nespresso...), and the spacious bathtub with a powerful Jacuzzi (don't be surprised... the water runs from the ceiling, then overflows from the tub to create the sensation of an infinity pool!). The head-board of the 240cm super king size bed is covered with coconut shell, and the mattress is so smooth that we felt like sleeping on a cloud. Precious rugs are covering the parquets, and modern or ancient art items are exhibited little bit everywhere in the 40 rooms and in the public areas. We liked very much the generously filled complimentary mini-bar, and were impressed by the efficient sound-proofing of the large panoramic windows: well appreciated at peak hours, when the traffic runs amok in Sukhumvit (which you won't notice when you go out: always use the metro to get anywhere in town, cheaply, quickly and safely). Chef Yuya Okuda's “La Truffe” restaurant operates from breakfast (excellent and a la carte) until dinner, by reservation only. Okuda has been educated mainly in Europe, and worked with the legendary Joël Robuchon (operating a dozen restaurants worldwide, including L'Atelier Etoile in Paris, and L'Atelier Hong Kong, with a total of 28 Michelin star!). Using the best ingredients from around the world, Okuda produces modern French cuisine with a Mediterranean touch, which we found young, light, fragrant and epicurean. Updated according to the seasons, the “a la carte” perpetuates some signature dishes like “Duck Foie Gras Terrine, infused with Port Wine, with Figs Jam and Mesclun Salad”, “Steamed Boston Lobster Salad, with Green Asparagus and Crab Meat, Basil Dressing”, “Oven roasted French Quail stuffed with Foie Gras, and Black Truffle mashed Potatoes” or “Warm melted 70% Chocolate Cake, with Mövenpick Vanilla Ice Cream”. We discovered this trendy hotel checking the classy Secret Retreats catalogue, featuring a capturing selection of the most exclusive high end boutique hotels in Asia. Ma Du Zi is also part of one of the Small Leading Hotels. REMBRANDT (****L): Those looking for a deluxe hotel with a warm, relaxed atmosphere, not to mention an amazingly good value for money, will like the Rembrandt. One of the most popular top class hotels in Bangkok, revamped with upgraded rooms (including nice family rooms), a stylish lobby-bar, and a well appointed Executive Lounge -with a stunning view of the city!- which we used very much during our stay. With its tall architecture and 407 rooms and suites, the Rembrandt looks like very much a corporate hotel; which comes quite correct, as many businessmen made it their home away from home. Nevertheless, this is also a perfect resource for leisure travellers looking for a softer notion of luxury. We found there one of the best level of hospitality we would ever expect in South East Asia; while there was no kind of plush ostentation at all. Except in the palatial «Rang Mahal» restaurant, the design remains «bourgeois» but not rich: making everybody feel at ease for a lovely holiday or business stay in the City of Angels. The rooms (30 Sq. M, with flat-screen TV, WiFi, large duveted beds...) are divided in different categories, though there is actually not a real difference between a Superior, Deluxe or Executive Room. After the refurbishment of the hotel, an egalitarian comfort comes to each floor. Nevertheless, we would like to recommend business travellers and couples, looking for a little extra and more intimacy, to rather choose the latest category: the 24th floor Executive Lounge is one of the most cosy in Bangkok (we have experienced almost all of them...). This is the place for separate express check-in and check-out, complimentary soft drinks and sweets all day long (alcohols and fine canapes are served in the evening), Internet surfing (you can use the two computers, or ask for your 24h free Wi-Fi password to the beautiful hostesses)... The Lounge is quite small, but well designed for intimacy and discreet business discussion. There is even a meeting room, which comes also complimentary. We liked the regular visit of the resident manager, F&B and general manager to greet the guests (some are regular since decades), inquiring on feedback or any special requirement: very professional and courteous, indeed. We also enjoyed the Rembrandt so much for its restaurants. F&B is brilliant and amazingly affordable; prices are miles away from those applied by the competitors. The legendary “Rang Mahal” is the hotel pride: this is the most authentic and luxurious Indian restaurant in Bangkok. We had a dinner there, and were quite astonished to see that at least 80% of the merry dinners where Indians! So, no development concerning the quality seems necessary. “Red Pepper” serves delicious Thai dishes in a lovely environment. It is extremely cheap, and captures a lot of hotel guests. “Mexicano” is a top 5 original Mexican restaurant in Bangkok. The “Café” is a coffee shop, with a piano-bar which starts to fill up from 6pm until late by night. Great atmosphere, indeed, extending to the lobby! The location of the hotel, in a quiet lane, a 3 minutes walk off Sukhumvit Road, is very central. Those walking down, will see many small bars, family restaurants, Thai massage parlours which are not so hanky-panky (and where a wonderful foot massage cost 5 EUR only...)... and maybe elephants (with their mahout begging some money to feed the animal)! Those feeling lazy can use the complimentary « tuk-tuk » to reach the Skytrain in minute: it makes Siam Square, Silom or the MBK Shopping center almost next door. This property (and its sister Rembrandt Towers Service Apartments ) is managed by a European team, whose efficiency is remarkable, and just joined the Warwick group of hotels. From the concierge till the maids, the staff is gentle and efficient. The day of our departure, we asked for a late check out; back from breakfast, we were surprised to see that our bedroom had been made up just like everyday, just to assure our complete comfort until our departure! This is the piece of detail which makes the difference between a good and an excellent hotel. The Rembrandt keeps on being posted in Tripadvisor as one of the most lovable hotels in Bangkok, which reflects very much our excellent impression. One of our finest addresses in Bangkok. SIRI SATHORN (****L): This boutique residence, displaying a modern, sober luxury after a recent refurbishment, gets a high reputation among business and leisure travellers. Spacious, designed for long or family stay, the Siri Sathorn serviced apartments are well located in the very central Silom-Sathorn district. There is a complimentary shuttle bus to the nearby Skytrain and underground metro Silom -Sala Daeng lines; though the green Lumpini Park (ideal for jogging), Patpong, the shops and banks are so close that we never used it during our stay. The quiet, almost somnolent lobby doesn't reflect the actual size of the residence. The 111 suites (ranging from studios to two-bedroom apartments) are large and conveniently appointed. We staid in a 100 Sq.m Two Bedrooms Designer Suite, which we would like to recommend to those travelling with a family. Immaculate, with classy furniture, well lit and spacious, it came with an immediate homey feel. Many expats have the same reaction, and book that category of apartment for long stay: they certainly like the full kitchen with a large table allowing to share a dinner with guests. Besides the well sized LCD TV, the soft matress of our bed and the lovely bathrooms, what we found most remarkable is definitely the perfect isolation from the external environment: we have visited few, if none, hotels with such efficiently sound-proofed windows: many tuk-tuk were passing by the street, and a building was under construction next door... but not even a whisper came up to our room! We slept like babies! There is small, pleasant and inexpensive coffee shop, with a pool-side view, where breakfast is served by an anticipating, very courteous staff. The double espresso is delicious, and there is a good selection of fresh fruits cuts. We crossed by many expatriates there, living on a long-term at Siri Sathorn; though this was high season, we didn't see so many tourists. The place might be still quite confidential for leisure travellers. 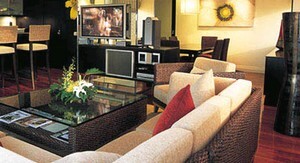 Rates are well balanced, at about THB 6000 for a One-Bedroom Suite, and THB 10,000 for a Two-Bedroom Suite. Including breakfast, Wi-Fi Internet, use of the fine fitness center, and shuttle van to the nearby shopping areas. Monthly updated promotions and money saving long term packages make this residence particularly attractive. A comfortable alternative to traditional hotels. COURTYARD BY MARRIOTT BANGKOK (****L): Located in an elegant residential and diplomatic district, this brand new hotel stands behing the Four Seasons and Grand Hyatt Erawan: in a quiet « soi » (lane), deserved every five minutes by a complimentary shuttle rickshaw («tuktuk ») lifting the guests to the Sky Train (BTS) station Ratchadamri (Siam square and Silom line). The BTS station Chidlom (Sukhumbit line), opposite the Central Department Store, can be accessed by a five minute walk through a picturesque lane, featuring cheap local restaurants and cafés. The worth the trip Erawan Shrine (« Four Face Buddha »), with spiritual music and dances, stands 500 meters from the « Courtyard ». Located in an elegant building, with a hip lobby, this contemporary hotel, contrary to many « Courtyards », has been designed for corporate and tourists alike. The lobby staff, fluent in English, is anticipating and, during our four days stay, helped us on many occasions with an authentic kindness (helping us to pack fruits, to weight our luggage, etc...). There is a little shop (« MoMo Mart » ), selling beverages, snacks and toiletry, at a very affordable price; we used it with pleasure, as there was no minibar in the room. We booked a Deluxe Room. Bright, intelligently designed, with a nice colors variation, we found it cool and trendy. The king-size beds are amazingly comfortable: this is a Marriott! There is a Samsung plasma TV, and tea / coffee facilities. A glass (with adjustable blinds) separates the room from the bathroom: this is a new, hip tendency, which we found quite stylish. The selection of toiletries is excellent, and you can sit in the spacious shower. Internet is provided via the hotel cable network, or using WiFi external signals (like « True Internet », which is quite cheap). There is a convenient fitness room, and a very beautiful, large swimming pool. We enjoyed the Jacuzzi: warm and powerful, with waterfalls, it overlooks a private Siamese style private villa hidden in a green park. It was so relaxing, that we felt like miles away from Bangkok city center! The « Courtyard » features 5 well designed, high tech meeting rooms (390 sq m of total meeting space). A smart and affordable hotel. MARRIOTT SATHORN VISTA (****L): Executive services apartments by Marriott are always a nice alternative for those looking either for a long stay... or for suites sold out at the price of a superior room in an international five star hotel. With 32 floors and 186 suites, this property remains amazingly intimate and homey: the rich marble lobby doesn't reflect the size of the residence, and the public areas are cosy and welcoming. Check-in is as kind as fast: we sat less than five minutes during the procedure, received a glass of fruit juice, a garland of fragrant flowers (a nostalgic tradition, little bit neglected by Bangkok hotels nowadays), and got into our apartment guided by a hostess. Bright and trendy, all 1 to 3 bedroom suites (65 to 165 sq m.) are equally pleasant and luxurious. The largest come with a large walk-in closet. All have a washing and drying machine: very useful for those staying a few days in a warm and dusty city like Bangkok, changing clothes up to four times a day. The American kitchen is also an attribute to serviced apartments. Else, there is no difference with a high end hotel suite: smooth king-size beds with a selection of pillows, expensive fabrics and furniture, flat LCD screen TV in each room, large desktop... and a bird's eye view of the City of Angels. Do like us, and try to book on the highest floor. The suites are sound-proofed, and the Sathorn district more quiet than what one could imagine: this is a residential area, with a limited number of attractions. Guests will like the relaxing atmosphere of the Marriott Sathorn Vista, its lovely pool (with green tiles... you feel like swimming in a pound. So exotic!) and its easy-going policy. Animation can be found just crossing the Sathorn avenue: Silom road, with its touristic and shopping attraction, plus plenty of restaurants, is located a five minutes walk. Metro (skyway and subway) stands 10 minutes to the top of the road (stations Silom / Sala Daeng / Lumpini), making any destination in this highly congested city at quick and easy reach. Room service is reasonably priced. The Momo Café is also very good value, and therefore attracts a lot of outsiders looking for a light international cuisine. Long stay guests can use the exclusive Residents Lounge, where a full buffet breakfast is served in a family atmosphere. With its qualities and so friendly, efficient staff, Marriott Sathorn Vista will be 100% perfect once Internet comes on a complimentary basis, like in most of the hotels nowadays. But it seems that it is already included in many packages: lots of them are extremely attractive, making this serviced apartment one of the most brilliant in Bangkok. How could we describe the Tenface? Let's say that this is somehow an urban hideaway, situated just off Ploenchit Rd. A three minutes complimentary « tuk-tuk » ride from the hectic Sukhumvit Rd (where lots of bars, restaurants and shops await the tourists). An oasis in the heart of the city, Still quite hard to find; order their vintage Mercedes-Benz limousine at the airport or, after a treasure hunt, feel proud for finally reaching the « soi » (=lane) where this sanctuary stands. The Tenface is styled in an original way and bears absolutely no resemblance to other hotels in Bangkok,: inspired by the ten-faced giant Tosakan from the epic Ramakien, it is definitely boutique, cozy, refreshing and rejuvenating. At check-in, we were handed an elegant box, featuring toiletry... and an unexpected iPod Nano Video with AV dock and remote control. This is the first hotel we visited lending iPods to its guests. Second originality: the box contained also a sim card with a private cellular phone number, and a small credit on it. It made us reachable on the spot, anywhere in Bangkok, and we found it a rich idea. The rooms are actually suites. The Tenface is well fitted for long-stay, and comes with some of the particularities of serviced apartments. We had a one bedroom suite, covering more or less the surface of two single hotel rooms (61 Sq.m ): designed into an elegant and relaxing minimalist style, with a top comfortable king-size bed, LCD cable TV, free broadband Internet Wi-Fi, and even an espresso coffee machine. From the bay windows we could see the contrast between the quiet, residential Soi Ruamrudee, and the nearby skyscrapers planted into the bustling capital city of Thailand. There is a nice fitness club, and a small though pleasant swimming pool. The Tenface is also home to the trendy Sita Bar, much visited by the new generation of Sino-Thai nice people, who like to see and be seen, mixing with the hotel guests enjoying elegant evening cocktails before heading to one of the supper-clubs or fashionable restaurants recommended by Pipek, the concierge and «entertainment guru», Note that the Tenface has its own, very affordable restaurant: the Wanara Eatery, serving light meals inspired by popular Thai specialties. Many promotion rates apply, making the hotel a very good value at about USD 120 for a one bedroom suite. HANSAR BANGKOK (****L): A haven of elegance, sophistication and comfort, this monument of iconic design rises up through the Bangkok skyline since December 2010. Situated at on the centrally located Rajdamri Road in downtown Bangkok, Hansar is perfectly positioned to take advantage of everything the Thai capital has to offer. Mere steps away from the hotel, the Skytrain takes the guests in 3 minutes to Siam Square and the commercial and business heart of downtown Bangkok. The hotel features an array of innovative and highly spacious suites. Contemporary in design yet timeless in elegance, they have been designed for business or leisure travellers and long-stay guests who are looking for something a bit different than the average hotel room. From the 59sqm Studio Suite, till the plush Vertigo and 129sqm Loft Suite, we have been seduced by the warm, trendy atmosphere: teak wood, precious silk, high-tech equipment and lovely decoration items bring a summit of refinement to the homey apartments. All include an intuitively designed workspace corner as well as an integrated kitchenette and dining area. This multifunctional space flows into an intimate relaxation and living area with a state-of-the-art entertainment system and a sublimely comfortable king-sized beds. The Vertigo Suites are particularly attractive. Designed for those seeking the absolute heights of urban luxury they distinguish themselves by an expansive living space, with floor-to-ceiling bookcases filled with contemporary artefacts, a sophisticated work area and lounge and entertainment space. Sliding doors open onto a uniquely cantilevered bedroom which seems to literally float over the city below. Throw open the curtains and take in the greenery of the Royal Bangkok Sports Club and the city below. At the heart of the suite is the truly palatial bathroom, a world unto itself, featuring dual dressing areas, vanity stand, centerpiece terrazzo bathtub and a separate glass-walled rain shower – complete with its own surprising view. Completed with 50-inch flat screen TV with DVD player, iPod docking station and free high-speed Wi-Fi, all suites have been tailored made for a geek clientele. 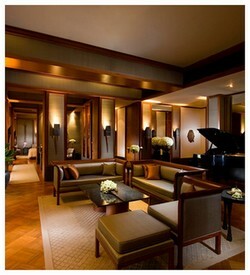 The Hansar Bangkok is managed by a former Kempinski F&B: which makes the dinner scene promising. We have not experienced yet Eve restaurant, specializing in inventive Northern Mediterranean cuisine. The pleasant Lobby Bar opens on a quiet open-air terrace. The breakfast, with freshly-baked pastries, tropical fruit and an extensive menu of Western and Asian specialties is served at Shine, by the large, lovely swimming pool perched on the edge of the cityscape. There is a nice, well equipped Fitness Centre. The LUXSA Spa offers an extensive menu of beauty and massage inspired by ancient Thai remedies and the latest international restorative techniques. Attractive rates make this luxury boutique hotel well worth a try. This is a one of the Small Luxury Hotels of the World. GLOW PRATUNAM (****): This trendy “low cost 4 star” hotel (at US$ 50 – 90 per night using the “lowest rate guarantee promotion“, with an easy cancellation process), perched atop the local and affordable Shibuya Pratunam shopping complex, is one of our 2015 best finds in Bangkok. With a dreamed location, in the proximity to the Ratchaprarop Airport Rail Link and Phaya Thai Skytrain / BTS, it has all shops, from the cheapest to the most prestigious, available next door: World Shopping Mall, Siam Paragon Mall, Gaysorn Shopping Centre, Siam Centre, Siam Square, Platinum Fashion Mall, and Pantip Plaza can be reached by a short and pleasant walk over lively and picturesque streets. A must for Singaporean tourists and businessmen, this precious address remains quite confidential on the western market. A pity, as it fits perfectly the taste of those, like us, looking for a 4 star cocoon with a relaxing, so-Zen touch. Asia is everywhere, under a modern declination: in the top-comfy, bright rooms inspired by the four seasons, with rich colours balanced by plush linens and pillow-top mattress and two types of dreamy pillows. Each perfectly sound-proofed room boosts a fantastic floor to ceiling view over Bangkok. We liked very much the spacious size (42 Sq m) and smart display of our Deluxe Corner Room. Complimentary high-speed Wi-Fi internet access, and mini-fridge with free-of-charge coffee, tea and water come as an appreciated bonus. The bathroom is nicely appointed. Large 32″ LCD TV with cable channels, and iPod docking station with radio and speakers give the room a geek note. Besides the location, comfort and savvy rate, the real advantage of Glow Pratunam compared with the neighbouring hotels targetting Western guests, is the very attractive F&B. We found the breakfast buffet better compared with what we used to get in many international four star hotels brands in Bangkok, with plenty of fresh tropical fruits, and lots of delicious specialties from the local cuisine which is, everybody knows, one of the best in the world. Maybe due to the competition of the inexpensive restaurants all around, Luna Sky Garden Café gave us the opportunity to enjoy a spicy, tasty and refined cuisine with a dedicated service. Do like us and try the Tom Yam Noodle Noodle Soup, or the Pad Thai noodles sprinkled with fresh lime. Last but not least, you can digest after lunch in the in-house massage parlour, just besides the reception desk, for a foot massage before relaxing by the hotel terrace-swimming pool. This most recommended hotel is managed by the fast growing InVision Hospitality group, featuring in its portfolio top-luxury properties like the legendary Villa Maroc Pranburi, close to Hua Hin: one of our favourite five-star resorts in Thailand. PARK PLAZA SUKHUMVIT (****): Strategically located 100 meters from the Asok skytrain and Sukhumvit subway stations, in the heart of Bangkok most prestigious business and shopping district, close to Queen Sirikit Convention Center, this lovingly designed boutique hotel impressed us quite a lot with its cool lobby-lounge, cozy spotless rooms, and anticipating young staff. Stylish and warmly welcoming, the 95 rooms with a smart hardwood floors are among the most comfortable we have experienced in Bangkok. Though smaller compared with what luxury hotels usually offer in South East Asia, they concentrate all the facilities a spoiled traveller would demand: 32-inch flat screen LCD TV (compatible for laptop computer display) and DVD player, large executive work station and lavish bathroom with rain-shower are available from the lowest category of rooms.. Richly designed beds are the Park Plaza Sukhumvit signature. Mattresses are among the smoothest in town: we felt like sleeping over a cloud. The design of the furniture -particularly the Ruhlman-like cabinet hiding the minibar- is a real success: nice looking and practical. A very reliable high-speed Internet is provided free of charge in all guest rooms and public areas (this is a global Carlson Rezidor Hotel Group policy). We appreciated the informal, trendy CO2 all-day restaurant and lounge, where all guests can enjoy complimentary soft juices, cookies and candies in a club-like setting atmosphere. CO2 is reputed for its affordable and light Thai and Mediterranean cuisines available round-the-clock. Though the fitness club looks little bit small, the adjacent roof-top swimming pool area is large and attractive, with a dramatic 180° panorama over Bangkok. Particularly romantic after dark, as the pool opens 24h: ideal for a midnight bath! From start to finish, the young and much involved staff operated with much anticipation and always with a smile: quick check-in and check-out, immediate assistance to any enquiry... and always somebody to call the lift for us... oil is permanently pulled in the wheels of this faultless, most pleasant hotel and affordable hotel. CITRUS SUKHUMVIT 22 (****): This chic design boutique hotel is located in one of the most animated sections of Sukhumvit: right in the heart of this posh district, with plenty of shops, spa and massage centers, pubs and restaurants all around. The infamous Sukhumvit Road traffic jams can be easily avoided, using the BTS Asok station, a short walk from the hotel. Despite of its rich night life, the « Soi 22 » remains a safe, pleasant street. We found the hotel itself so quiet, with nothing to disturb our sleep, and didn't realize that we stayed in the middle of the action. Opened a couple of years ago, and just handed over to the well established Compass Hospitality Group for an upgraded management, this hip and cool boutique hotel is warm and inviting. Like in many hotel in New York, the lobby stands on the first floor; next to the restaurant, and to the lounge bar with a nice view over the Soi 22. The young and friendly reception staff made our check -in as smooth as silk. The rooms are accessible by a key-card secured lift. Safety seems to be one of the priorities of the hotel. Our 31 sq.m Superior King room was fitted with high-tech technology. A state-of-the-art entertainment system (WiFi, USB Port, LAN connections, HDMI & Adapter ) allows guests to plug in a thumb drive or notebook: watching the latest movie in the comfort of their room on the wall mounted 40” LCD flat screen TV... Just like in more hotels in Bangkok, WiFi is free of charge, and everybody will like surfing the web in the intimacy of his room or, better, relaxing along the pleasant rooftop swimming pool. The fine quality breakfast is served in the Citrus Café, which offers the usual local delights plus International dishes that include the very popular Lamb Shank and Double Beef Burger. Perfect for business and leisure travellers alike, the Citrus Sukhumvit 22 hotel offers an ultimate bonus: the rates are amazingly attractive, starting from as less as approximately THB 2,500 in a Superior Room with free WiFi and late check out. AMARI WATERGATE(****): One of the airlines crews' favourite, this elegant recently opened 575-room hotel, in the very heart of Bangkok, is a splendid choice for businessmen (the World Trade Center is cross the street) and tourists (Sukhumvit road and Siam Square are a ten minutes walk away). Behind the Amari Watergate stands the bustling Talad Pratunam: one of the most amazing day and night market in town. The spacious guestrooms of 40 sq.m are elegantly decorated in pastel fabrics with Thai artefacts. All are equipped with IDD phones with voicemail, fax link, personal safe and minibar. We like the twin hand basins in the marble bathrooms. All rooms have a dramatic view over downtown Bangkok. 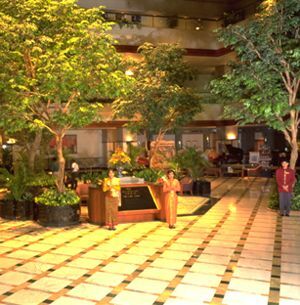 Businessmen enjoy particularly the Corporate Floors, on the 29th-31th floor of the hotel. For these top executive clients, everything is available since they step inside the lobby: in-room check in, welcome drink and refreshing face towel, and daily breakfast in the VIP section of the Promenade Coffee Shop. There is also a 24 hours complimentary fruit bowl, coffee/tea facilities, and a selection of business publications on each floor in the lift landing area. Each Corporate Floor room is equipped with e-mail and Internet connections. Full Business Centre services are available, including three small meeting rooms for guest use. The Amari Watergate is extremely popular among travellers. Not only for its discerning comfort and much affordable rates (USD 184 for a single Superior Room and USD 248 for a double Executive room; with very interesting discounted packages); but also for its security. It has been regularly identified as one of the top 3 safest hotels in the city, by the Bangkok Authorities: thanks to the Building Automation System, regular staff training, and up-to-date fire prevention and safety equipment. We like the fact that this nice hotel is also very much family oriented: this is the only one downtown with a Kids Club. Children will be delighted to find a special corner, prepared for them in their room upon check in, with plenty of welcome gifts and candies ! In the bathroom, they will find a rubber duck, and during their stay the hotel's photographer will take a picture of them with their favourite number of staff: as a souvenir to take home ! Thai service -and we get used of it- will never stop amazing us. And, at the Amari Watergate, it is actually first class. Children are also taken care of when parents enjoy with them the restaurants. The choice is great, between the Heichinrou Chinese Restaurant, the Grappino (fine Italian specialities in a trendy atmosphere), and the famous franchised Henri J. Beans Bar & Grill (where a lot of expatriates hang up by night). The buffet at the Promenade Coffee Shop is excellent: its show kitchen is a feature of the restaurant, with uniformed cooks preparing eggs, pastas and meats on request. Their fastuous Sunday Lunch is a favourite in town. One of the best choice in Bangkok. Part of the Amari Hotels & Resorts Group, managing fine hotels throughout Thailand. CHAOPHYA PARK (****): Fairly well located in Rachadapisek, one of Bangkok’s newly emerging business, leisure and entertainment districts, this top comfortable, yet affordable hotel makes any attraction at easy reach: the subway, MRT station stands two blocks away. Two lobbies on separate floors allow a quick check in. The recently refurbished 402 rooms and suites, displaying a pleasant Thai design, are comfy, large and well appointed: all with IDD Phone, complimentary high speed Internet, Sat TV, electronic control panel board, safe deposit box... Tea and coffee facility is available, free of charge. There is an Executive Floor, with a lounge. We like the «green» concept of the Chaophya Park, where many efforts are undergone to protect the environment. This eco-oriented hotel hosts the 70 treatment rooms «Bali Spa and Thai Massage Centre»: one of the largest therapeutic massage complexes in Bangkok. The hotel has a fully equipped gymnasium and out door swimming pool with Jacuzzi. It is the only city hotel to feature a full service Golf Driving Range on 2 levels, with fully computerised caddies. The complex in which the hotel stands includes a huge convention center and the «Entertainment World» recreation center. The 7 restaurants and bars include the recently opened, and yet reputed Al Massimo Ristorante Italiano: featuring fine Italian cuisine along with walk-in wine cellar. If you want to mix with local people for cheap, delicious Thai dishes, just cross the road, and join one of the small open-air restaurants after dark, when the air gets cooler and the «sanuk» warmer. Room rate is about THB 4,000 till 6,700. Suites start from THB 8,800. Packages and promotions are permanently available.